Sonic logs are widely used for both geophysical and petrophysical applications. The velocity of sound in rocks is considerably more complicated than some other physical properties, such as density, and the math presented below reflects this. Elasticity is a property of matter, which causes it to resist deformation in volume or shape. Hooke's Law, describing the behavior of elastic materials, states that within elastic limits, the resulting strain is proportional to the applied stress. Stress is the external force (pressure) applied per unit area, and strain is the fractional distortion which results because of the acting force. The modulus of elasticity is the ratio of stress to strain. Where F/A is the force per unit area and dL/L, dV/V, and tanX are the fractional strains of length, volume, and shape, respectively. Where X and Y are the original dimensions, and dX and dY are the changes in x and y directions respectively, as the deforming stress acts in y direction. Velocity of sound in a material depends on these elastic parameters. Sound can be propagated in rocks with several possible modes. On the surface of the earth, various wave modes are generated by earthquakes and can cause severe damage. In a borehole, a logging instrument emits a sharp sound pulse, which transmits through the rock, again with several modes of transmission. The most useful are the compressional, shear, and Stoneley waves, the first two being transmitted as both body waves inside the rock and surface waves along the wellbore face. The measurements made by a sonic log are recorded in units of travel time, although a velocity scale may be superimposed on some older logs. Geophysicists use velocity values derived from seismic or well log data to assist in their analysis of depth, lithology, porosity, and hydrocarbon indications. Petrophysicists use the inverse of velocity for porosity, lithology, and hydrocarbon analysis. The conversion factor of 10^6 accounts for the conventional units of measurement on the sonic log – microseconds per meter (or foot). The velocity of sound in a rock is related to the elastic properties of the rock/fluid mixture and its density, according to the Wood, Biot, and Gassmann equations. Although it is not always a precise solution, we often invert equations 5 and 6 to solve for Kb and N from sonic log compressional and shear travel time values. These can help overcome the lack of empty rock-frame data. 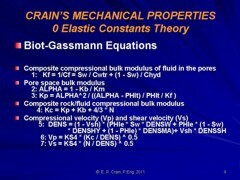 NOTE: Abbreviations used in the literature for elastic constants vary dramatically and no consistent set was found. The abbreviations used in this Handbook reflect those used in recent Schlumberger papers. CAUTION: This book uses the abbreviation "V" for Velocity AS WELL AS for Volume, as in Vsh for volume of shale (not velocity of shale or shear velocity). Likewise the abbreviation K is used for permeability (eg Kmax, Kv, Kh, etc) as well as for compressional bulk modulus. Watch the context! 1. acoustic velocity is intimately connected to density and elastic constants of the rock. both compressional and shear arrivals. It is the last fact that suggests that a log of acoustic velocity or specific acoustic travel time (sometimes called "slowness") might be a reasonable predictor of porosity. Snell's Law applies to all electromagnetic waves as well as acoustic waves. Sonic logging tools consist of one or more sources of pulsed sound energy and a number of sound detectors. The sound travels from the source on the logging tool, through the mud in the borehole, to the rock. Here it is refracted at the critical angle, according to Snell’s Law, and travels in the rock parallel to the borehole. The source creates a compressional wave through the mud, a portion of which undergoes mode conversion to create a shear wave as well as the compressional wave in the rock. The shear wave is slower than the compressional, and modern sonic log processing can segregate and record both. Both compressional and shear waves refract back into the borehole, the shear converting to a compressional wave, to be detected by the receivers in the logging tool. Schematic diagram of a simple sonic log showing sound paths, following Snell's Law. 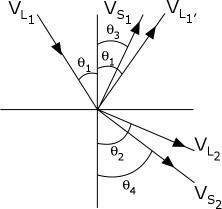 Note that V is a Velocity here, while V is used as Volume elsewhere in this Handbook. Find the velocity of sound in a gas with same composition and under the same reservoir conditions as before, given the ratio of specific heats equal to 1.37. Cw must usually be found from laboratory measurements. Find the sound velocity of oil and water from the previous example. The velocity of longitudinal (compressional) waves in solids can be predicted from the following two equations. To translate these formulae into metric, convert density into gm/cc, velocity to Km/sec and the various moduli to megabars, and change the constant terms to 1.0. To convert moduli in megabars to psi, multiply by 6.89 * 10^-6. To convert megabars to Kilopascals, multiply by 10^4. Also note that 1 GigaPascal (GPa = 10^10 dynes/cm^2. This is called the Wyllie time average equation and is true for many situations where the components are not very compressible, such as oil, water, sandstone, and shale. It does not work too well with gas under low pressure. This formula is an empirical relationship and is not rigorous, and is therefore, not a law of physics. This expansion works well as a predictive tool with oil or water in the porosity, as the travel time of sound in liquids is quite predictable. Equation 21: Vgas = ((Ks * P) ^ 1/2) / DENS, where K is ratio of specific heats and P is pressure, looks like a good solution for finding DTCh for gas zones. However Ks is not usually available and some other solution is often needed. The Biot-Gassmann equations are often preferred, empirical values for DTCh are also used, as in the graph at the right..
What percent change in velocity could be expected if 75% of the pore space were filled with methane gas? 0. Convert velocity to cm/sec. 1. Invert the velocity equation and solve for Kc (sometimes referred to as the space modulus M) for 100% water-bearing condition. 2. Determine Km from handbook data. For this example, Km was estimated to be 74.5 * 10^10 dynes/cm2 (74.5 GPa) because the rock was a mixture of limestone and dolomite. 4. Determine fluid properties at reservoir conditions. Water density = 1.085 gm/cc. Gas density was estimated to be 0.157 gm/cc. Kf from the Wood equation. 5. Solve Gassmann equation for Kb at Sw = 100%. 6. Solve this equation for Kc with combination gas/water conditions. 7. Solve density equation for gas/water combination. 8. Solve for Vp for Sg = 0.75. Utilizing this methodology and the stated assumptions, there would be an approximate 10% change in velocity (14,000 - 12,500 / 14,000) from a 100% water saturated zone to one that has identical rock properties but 75% gas saturation in the pore space. 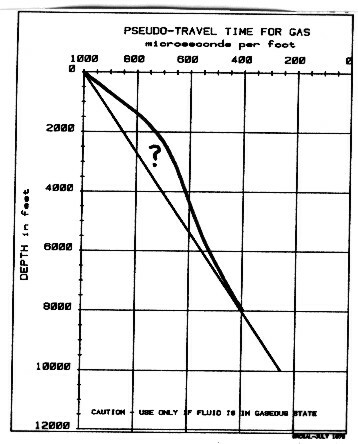 As a matter of interest, if the rock frame compressibility were assumed to be 5.0 * 10^-7 psi-1, the computed gas/water-bearing velocity would be 13,100 ft/sec. This is only 7% slower than the observed water-bearing velocity and helps demonstrate the sensitivity of the calculation to the assumption of rock frame modulus. Tertiary sandstone with 32% porosity. What percentage change in velocity could be expected if 75% of the pore space were filled with methane gas (gas gravity 0.8)? Estimated Cb = 3.5 * 10^-6 psi^-1 from experience. Compressibility values on poorly consolidated formations are difficult to obtain. It is believed that many operators are attempting to measure and catalogue such data. However, most of these data are being held confidential. The velocity change computed with these assumptions is approximately 34%. However, the computed velocity of 5,370 feet per second, or 186 microseconds per foot, compares reasonably well to observed sonic log values in gas zones having rock and reservoir properties similar to the assumptions made in this calculation. As a matter of interest, if the bulk compressibility of the rock frame is assumed to be 3.0 * 10^-5 psi-1, or an increase of nearly an order of magnitude, the computed Gasmann velocity for 75% gas is 5,000 feet per second. This is an additional 4.5% decrease in velocity from the water-bearing case. Note that the result depends largely on the choice of gas pseudo-travel time, and this is subject to some error in judgment.